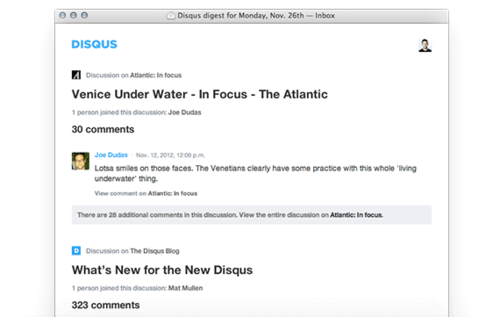 We’re excited to announce the release of Disqus Digest emails. Digests provide updates from Disqus on the conversations and people you care about most, combined into a single daily or weekly email. Digest emails are designed to provide a quick view into Disqus conversations which are relevant to you. They include article headlines, publisher information, a selection of some of the best comments, and links to jump from your inbox right into the discussion. We hope Disqus Digests keep you up to date on the most relevant discussions without cluttering your inbox, the way instant email notifications might. When you star a discussion, we’ll be sure to include updates from that discussion in your Digests. Speaking of stars, we’re also pleased to announce an update to the Disqus star button. We’ve simplified its design and function, and think you'll find it easier to use. Let your friends help you find great discussions from around the web. When someone you follow participates in a discussion, we’ll let you know about it in your Digest emails. You can easily follow others from any Disqus thread by hovering over a user's avatar and clicking "Follow". Whenever you receive a reply to a comment, we’ll include the reply and updates from the discussion in your Disqus Digests. Disqus Digests are just one step toward more comprehensive, less intrusive email notifications. If you have any thoughts you'd like to share on Disqus Digests, please let us know here, or feel free to comment below. Like other Disqus emails, you can unsubscribe or reduce the rate at which you recieve Digests by adjusting your notification settings. Interested in learning more? Please visit Digest FAQs. Please note: we’re rolling out Digest emails to everyone over the next few weeks, so keep checking your inbox if you don't see Disqus Digests immediately.